While it is considered obsolete now, the DVD recorder had one slight advantage over the typical PVR that you can rent today from Rogers Cable. That is keeping a recording permanently. I’ll give you a great example. In 1994, my future father-in-law won tickets to go see the Toronto Maple Leafs during the playoffs facing off against the Sharks in San Jose. My future wife came with him, bearing a sign that said “DOUGIE G. FOR PRIME MINISTER”. This is of course a reference to legendary Toronto Maple Leaf center Doug Gilmour. Then my wife saw the unmistakable Canadian hockey broadcaster Don “Grapes” Cherry in the lobby, with his colourful suit and camera crew. She shouted out “GRAPES!” Nobody else in California would have known him as “Grapes” so he knew it was a fellow Canuck. He saw the Dougie G. sign — his favourite player from Kingston, Ontario. He asked her to come on down. That’s how my wife got on Hockey Night in Canada back in 1994. We have a copy of this on video tape, but when the game was re-run a couple years ago, we recorded it including the part with my wife on our Rogers PVR. It was nice to have it digitally but we always knew we’d lose it if the PVR busted. There’s no way to retrieve a recording from it, according to Rogers. So when it finally kicked the bucket, we lost the hockey recording. No matter; we’ll just wait for the next re-run. If we only had an old-fashioned DVD recorder, however, we’d have a hard copy that we could have kept safe and sound forever! I had a DVD Recorder for a while circa 2002-2004. Never recorded anything from TV but used it to transfer all my old camcorder VHS to digital. Even by then, some of the tapes had begun to wash out and many probably would have been total losses had I waited much longer. One of the best purchases I ever made, methinks. I think so too. I have a VHS to PC conversion kit on my Amazon wishlist currently. I don’t know how easy it is to use one of those, but I do want to make my VHS recordings permanent. I am sure you can relate. Not just home movies, but I also have rare music videos and interviews that are currently NOT on youtube. 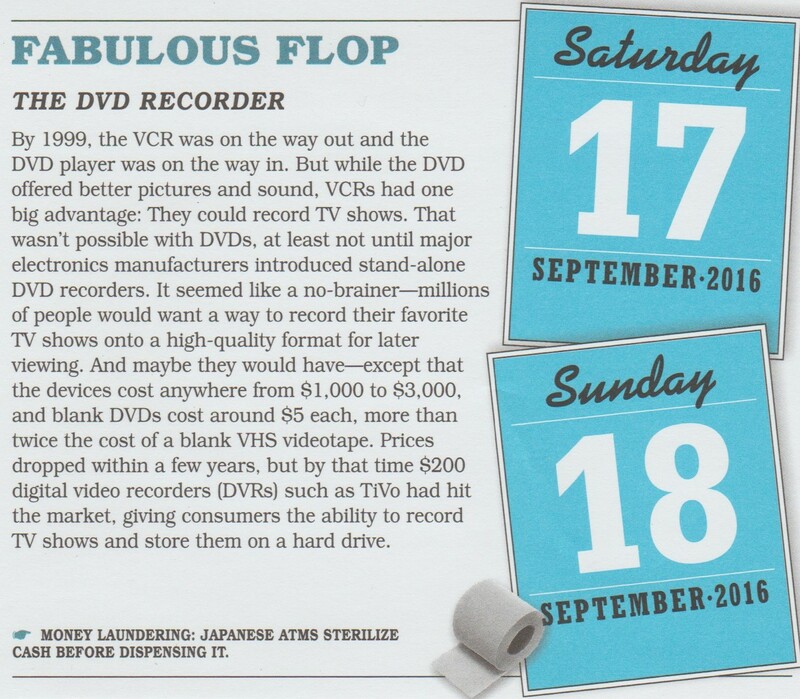 I had no idea DVD recorders were that expensive! No wonder it was a bit of a failure! However, the Japanese have a great practice with the ATM shenanigans there. What do they have going on there in Japan? Oh with washing the money! Hahah, I have another one coming tomorrow, you’ll see. I figured there must be a reason why none of my friends owned a DVD recorder. Out of everyone’s price range! That Sharks Leafs series was a great one! I know Jen agrees! I think for her, that was the happiest vacation of her life! Out of curiosity, do you know which game they saw (game 3 loss, game 4 win, or game 5 loss)? I think I still have some highlights on VHS! Games 3 and 4, dude! May 6 and May 8 win! Seeing Cherry and MacLean so young in those clips makes me feel so very old. That’s awesome your wife got on HNIC. For better or worse, Coach’s Corner is as Canadian as it gets. Back to the point, discs dropped off so fast it made my head spin. I totally thought they were the future and now they’ve become obsolete. I can’t think of any other tech that has come and gone so fast. I know right? Even if you don’t watch hockey you know who Grapes is. And yes good point about the discs dropping off abruptly. Obviously I still collect my music on discs…but I have been purging and purging my DVD collection. I have a few hundred to ditch. A lot of TV seasons. Streaming really changed movies for me. A remote with a cable? I’ve never seen one! Never had one of these. Of course, I haven’t had a TV since about 1998 either, so it wouldn’t have been on my radar. The first time I could copy a DVD was when my computer came with a DVDr drive. Funny thing, I have a DVDr drive, but never burn with it. Also, when I don’t like the candidates, I still make my own checkbox on ballot slips and write in Don Cherry and check it proudly. Also, shame you lost that moment with yer lovely wife and Grapes. Maybe contact the CBC? That’s where we got the VHS copy from! They contacted the CBC who asked for $20 and sent a copy of the three or so minutes Jen was on TV. My goal now is to convert that to digital. I am currently shopping for conversion kits.